Step up in style with our high-quality line of running boards for trucks. 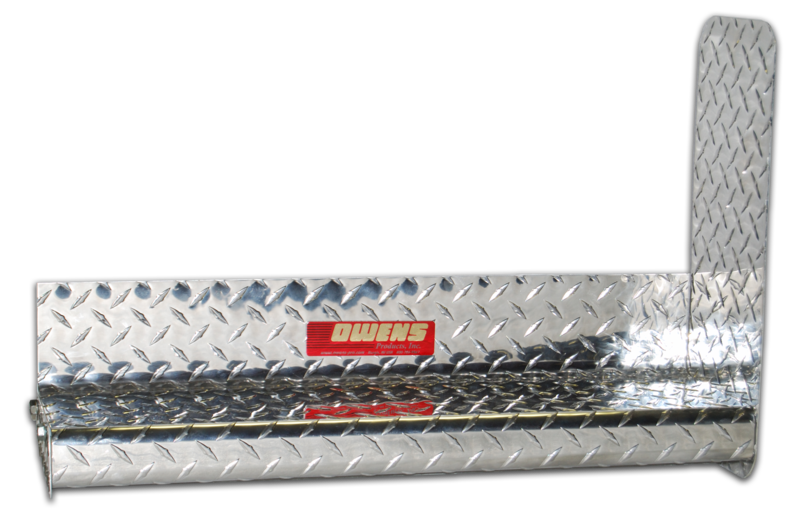 Owens Products is the leader in truck running board manufacturing and application depth. Choose from our many styles of running boards, including Owens Commercial Boards (OCB) made from .100 Diamond Tread Aluminum or Grip Strut Aluminum. These heavy duty boards perform day after day on the job. Owens Classic Commercial Grade Boards are built for heavy use, manufactured from .100 Diamond Tread Aluminum. Full-size stone guards are included to protect your vehicle and steps from road debris. The diamond tread design on these aluminum side steps provides natural traction for secure stepping all year round. Available in cab or full-length applications, these running boards also feature universal brackets to fit an array of vehicles. These commercial boards are perfect for fleet, construction and municipal jobs. Note: This set is a cab/full length set with 4 stone guards. If you need a cab length set with end caps, please order end caps separately (PN C8000EC-10). Please Note: If the length you need is not available, these universal boards can be cut down to any length. Just pick the next lengh up from the length you need and have it cut down. You can cut it down yourself, or have us cut it down for a minimal fee. Questions about fitment? Please call 1-800-726-9367.